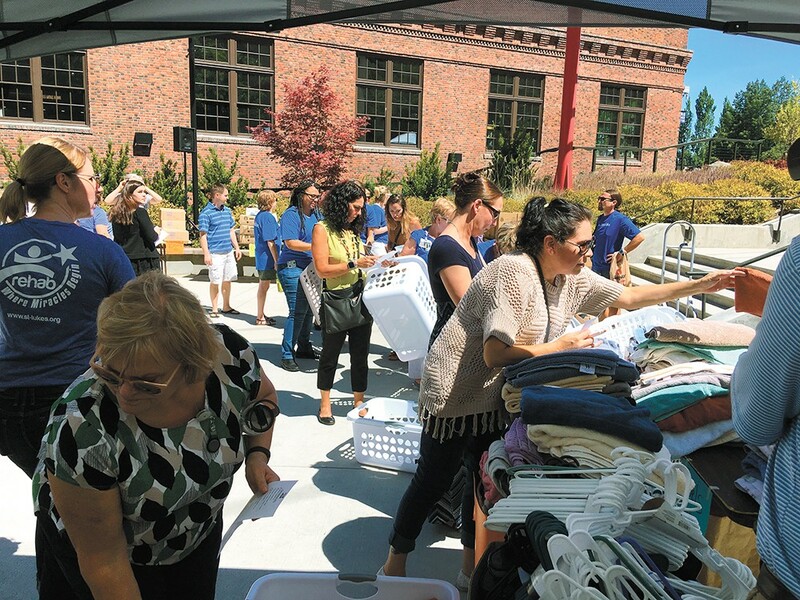 Volunteers help fill welcome baskets with household items for youth who got housed during the 100 Day Challenge in 2017. Until recently, life was incredibly unpredictable for 20-year-old Justice Anderson. "Mom, she kind of tried, but she was into meth and heroin and plenty of things. Dad was into meth, heroin, OxyContin and whatever else you could think of," Anderson says. "I grew up into a very, very unstable environment, so that kind of taught me to stay the hell away from all of them drugs." After more than a decade of bouncing from home to home with his family, and then two years homeless on his own, Anderson was able to get a stable apartment with help from SNAP (Spokane Neighborhood Action Partners) last summer. With help paying rent, he was able to sign a lease, and now he receives Social Security disability payments due to epilepsy. "So I'm at the most stable position that I ever have been in my life," Anderson says. "Luckily everything's kind of sorting back into place, and that's all because of SNAP." Anderson was one of more than 100 young people to get housing during the 100 Day Challenge last summer, in which Spokane competed with Pierce and King counties to rethink the way their systems work and see if they could rapidly improve the way they help homeless youth. Service providers agree that prioritizing resources for young people can save communities money in the long run, and ideally prevent chronic issues with health and housing security before it's too late. Now, the nonprofit statewide coalition of homeless service providers and businesses that helped lead that challenge, A Way Home Washington, hopes to spark similar competition and camaraderie between communities around the state by naming "Anchor Communities." In partnership with the state Office of Homeless Youth, carefully selected Anchor Communities will focus on data-backed efforts to decrease homelessness among youth and young adults, particularly among overrepresented groups such as those who are LGBTQ and/or people of color. With applications open through the end of July, the first four Anchor Communities will be named this September, and eventually the goal is to have 12 to 15 throughout the state. "What they get in return is some enormously positive and competent training and coaching about how to build their local capacity, and they will be part of a movement," says Jim Theofelis, executive director of A Way Home Washington. "We believe Washington is positioned to be a national model." While being named an Anchor Community won't come with grants from A Way Home Washington to directly fund beds or services, it will come with help proving what is effective and making a community plan, which in turn should enable communities to make strong asks for state funding and other sources, Theofelis says. The nonprofit will spearhead advocacy at the state level. "I think what we're hearing from communities across the state is if there's a viable plan that makes sense, communities want to lean in and help solve this problem," he says. "The problem has been there has not been a solid enough plan for local philanthropy to buy into." When a homeless young person asks for help, it is imperative that communities have the ability to say, yes, there is a bed for you and we can get you the services you need, Theofelis says. Having that ability to say "yes" is the key to reaching "functional zero" for homelessness among those aged 12 to 24, he says. It won't mean no young person will ever wind up homeless, but help will be there when needed. Homeless service providers in Spokane, who met with Theofelis and two of his staff members working on the Anchor Communities Initiative last week, think the city stands a good chance at getting selected. "We're already in such a good position because we've been doing the work," said Tija Danzig, the city's Homeless Services Program manager, during the July 11 meeting. During last year's challenge, the city changed the way young people are screened for eligible services by pulling them into a separate category to be rated for their level of need against other youth, instead of being lumped in with adults also waiting for services. That, coupled with additional rental assistance and improved communication between service agencies and the city, who formed a team for the challenge, means that youth are continuing to get into stable housing at an increased rate, Danzig says. The city also has a better idea of the scope of youth homelessness, which could benefit Spokane's application. Each Anchor Community will need to understand the rate at which young people are landing on the streets, and work to improve its network of prevention, emergency response, and housing and supportive resources, with an emphasis on data-based policy decisions, Theofelis says. For example, among the estimated 13,000 young people who are unaccompanied and homeless in Washington state, 48 percent who accessed a homeless service said it was their first time doing so, according to 2016 data compiled for A Way Home Washington. The original print version of this article was headlined "Anchored to Community"